OntrackBlog.com: Which social sites do people use most for sharing? 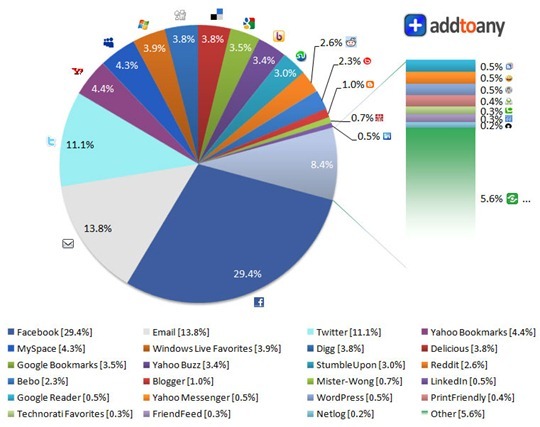 Which social sites do people use most for sharing? 1 ridiculously huge coupon a day. It's like doing Toronto at 90% off! This graph show how people were sharing web pages in the year 2007. Google Bookmarks and delicious were the two most favorite destinations for bookmarking online content while a large number of Internet users also preferred saving pages into their local bookmarks or favorites. Habits changed in 2008 as social networks replaced social bookmarking sites. Facebook, Digg, MySpace became the most preferred destinations for sharing content while delicious, Google Bookmarks and other "online bookmarking" services took a backseat. Enter 2009. Facebook is now the most popular site for sharing content followed by a distant Twitter. Surprisingly, more people now prefer to bookmark content on Yahoo! 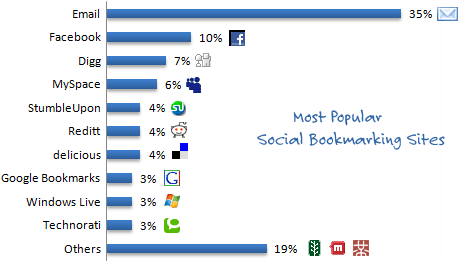 Bookmarks and Windows Live Favorites than Google or Delicious which dominated the scene in 2007. And here the next 10 places where Internet users are posting content with the purpose of bookmarking or for sharing with their social contacts. The sharing statistics for 2009 are courtesy Pat from AddToAny while the numbers for 2008 and 2007 were provided by ShareThis and AddThis respectively. All these companies provide some very awesome social sharing widgets for both blogs and regular sites. While the report suggests that more people are using Facebook than email to share content on the Internet, I guess that may not be the case because not everyone feels comfortable sharing their email address with a widget so they probably use their own email client to share links of web pages with friends.